Market your medical equipment and anesthesiology devices with this targeted, accurate anesthesiologist email list from Bookyourdata.com. Find anesthesiologists online easily in this one consolidated directory, which pulls doctors with the specific specialty of anesthesia and perioperative medicine into one resource. 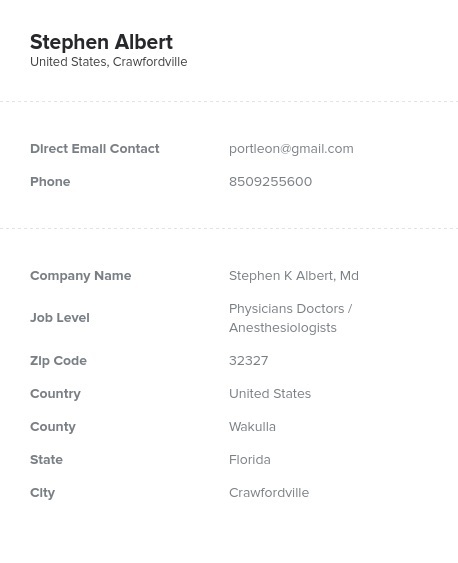 Get the accurate contact information of anesthesiologists working at many different hospitals and medical centers with this one mailing list. This is a great medical marketing resource that pulls the key points of contact in the anesthesiology world together into one database for you. Find all of the information you need to start talking to the experts in administering anesthesia: email addresses, titles, names, phone numbers, company information, postal addresses, and more. With this specialized doctor leads list, you can get in touch with the people who would be the most interested in your business, medical service, or pharmaceutical products. Involved with preparing patients for major surgeries, anesthesiologists are responsible for bringing patients into and out of unconsciousness in a safe way. They deal with some of the most complicated and dangerous drugs and equipment in medicine: delicate monitoring equipment, high-powered sedatives, epidurals, nerve blocks, ventilators, intravenous drugs, painkillers, and others. If you have a system, service, or product that can help them bring patients into and out of sedation safely and efficiently, let them know by putting this B2B marketing database to good use. This is one of our pre-built, ready-made lists of sales leads. It's a product built for those hoping to reach out directly to their target audience, email leads more effectively, and make sales within their target medical demographic. It's ready for you to buy and download right away. Start talking to anesthesiologists with this email database now!